Today’s card is a riot of rainbow colour using those brilliant Hip Hop Girls from Visible Image. The last time I used these images I heat embossed them with black embossing powder and outlined them with white, and this time it’s the reverse; white embossing powder outlined with black. To be honest, I think they look fab in any colour. Here’s how I made this one. On a piece of 300gsm water colour paper, paint a rainbow of colours from one corner to the centre, and reverse the colours from the centre towards the opposite corner. I used a fair bit of water with each colour, then cleaned the brush before moving to the next colour and made sure the colours just touched each other so that they mixed slightly. Then I spritzed the card with water and dried it all with a heat tool. Next, I took the Two Tone stencil and laid it over different parts of the card, then I used a baby wipe through the circles part of the stencil to lift the colour. The card was left overnight to completely dry. 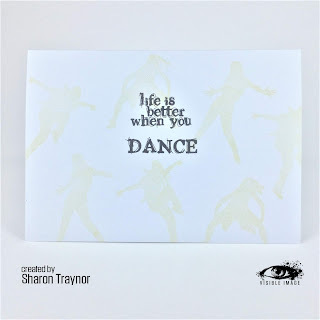 The girl dancer images were embossed with white embossing powder. You may need to repeat stamp the images if your watercolour paper has a bumpy texture. Outline the images with a black pen. Stamp the two arrows from the set in distress oxides, and then gently blend around the outside of the panel with brown distress ink. Mat the panel onto black card and then onto a white card blank. Stamp the sentiments onto scrap white card, fussy cut them and then attach them to the front of the card with 3D foam. 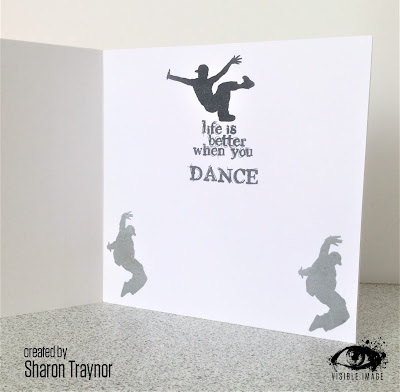 Decorate the inside of the card by stamping the girl images in Antique Linen distress ink, and the sentiment from the Street Dance Boys in black ink. Gansai Tambi Water Colours (cadmium red #30, orange #33, lemon yellow #40, may green #51, Persian blue #63, purple #139), Paintbrush, Water Spritzer, baby wipes, Versamark clear ink, Wow! opaque bright white embossing powder, micron black fineliner pen (0.05), Distress Oxides (candied apple and blueprint sketch), Distress Inks (gathered twigs, antique linen), Versafine Onyx Black ink, Water Colour Card, black and white card, 3d foam. We hope you are having a good Monday! Today I have a bit of autumnal colour inspiration for you, on a contemporary card made with some fantastic stamps from the new release by Visible Image. 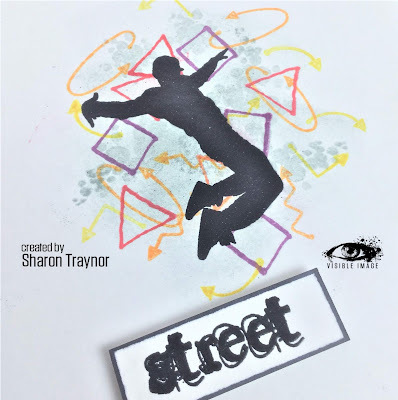 I absolutely LOVE these Street Dance Boys stamps; they are such a useful set for those hard-to-make masculine cards, and for those difficult-to-please teenage boys too. This is fast becoming one of my favourite sets (along with the Hip Hop Girls) because they ‘just work’, no matter what treatment you give them. They look fabulous against an inky background yet they really don’t need much added to the card either, so they are perfect for a CAS look too. Anyway, the theme for the monthly challenge in the Visible Image customer Facebook group is AUTUMN COLOURS. So I thought I’d just take the colours and use them with the smaller stamps in the girls and boys sets to give a bit of inspiration to anyone that enters the monthly challenge. Hope you like this one. 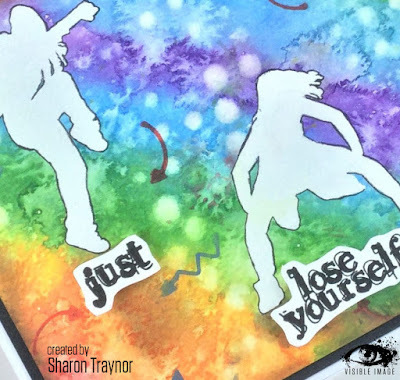 Take two strips of card measuring 8″ x 1.25″ and make a random pattern with the small stamps from both the Hip Hop Girls and Street Dance Boys stamp sets, using all the distress ink colours except for the iced spruce. These Strips will form the outer borders of the card. Cut a strip of white card to fit the middle (8″ x 5.5″). Lightly blend some iced spruce into the centre, then make a more open pattern with the stamps that you used on the borders over the top. Stamp the bubbles from the Set The Tone stamp set in second generation iced spruce distress ink. Let this panel dry. Once dried, treat it with an anti-static pad and heat emboss the boy image in black embossing powder. On a spare scrap of card, heat emboss the word ‘street’ in black powder too. TIP: if you heat from below you will achieve a smoother finish on the embossing. Take a black marker pen and run it around the outside of the ‘street’ sentiment, and also along one edge of each of the border panels. Attach all panels to an 8 inch square card blank and pop the sentiment up onto 3d foam. Versamark clear ink, Heat It Up black embossing powder, Distress Inks (mustard seed, carved pumpkin, festive berries, seedless preserves), black Promarker, 3d foam, white card. (For the inside: Memento tuxedo black and London fog ink). Thanks for stopping by and I’ll be back here soon! We hope you have a really great day!